The ability to blend individual sounds into words. The ability to segment sounds in words. The ability to match single letters to individual auditory sounds. The ability to read nearly any three sound word (consonant-vowel-consonant). The ability to read nearly any single syllable basic code word almost perfectly. If your child or student has not established these essential early literacy skills go to the Phonemic Awareness Activities and the Reading Activities I pages for reading activities designed to improve these phonemic awareness and early reading skills. Each of these words contains advanced code. Research indicates that by fourth grade 60 percent of the written words children see contain sounds represented by advanced code. Grasping the concept that two or more letters can represent a sound can be very difficult for many children. If we expect children to develop good reading strategies, we must expand their understanding of the alphabetic principle and help them make the leap from basic code to advanced code. Here is a simple way to illustrate the logic of the advanced code for them. Click here to see the Logic of Advanced Code! This variation in our written code is called CODE VARIATION. As the picture on the left illustrates, the sound /oo/ in our language can be represented seven different ways! Learning the various spellings for the various sounds in our language requires lots and lots of teaching and practice. Remember, we are teaching children to break a code so we need to teach them how the code works! The reading activities below will help you! Vowel Code Variation: Print a list of code variation for each vowel sound in the English Language. Each list is organized top to bottom, most frequently occurring variation to least frequently occurring variation. This inherent aspect of the English written language is called CODE OVERLAP and is illustrated by the picture to the left. Code overlap refers to the fact that some letters and/or combinations of letters can represent more than one sound. For example, the letter combination 'ea' can stand for the sound /ee/ as in 'read', /ae/ as in 'steak' or /e/ as in 'head'. Confused by code overlap? This reference organizes the most frequent occurring code overlap in the written English language. Print the poster for a handy reference during reading activities and instruction. Print the following template on Avery 8163 labels. Place the vowel combination label on one side of an index card and their overlap sounds label on the other side. 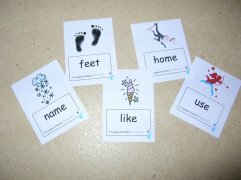 Place these cards in your classroom (on a pocket chart) as a reference during reading activities and instruction. Code Variation and Code Overlap cause a great deal of confusion for many children. Their lack of code knowledge is many times the cause of their poor reading fluency. Often times a formal reading fluency measure is not needed to determine a child's reading fluency is below grade level. The problem is easily identified by listening to them read. Identifying the problem is easy. Identifying the CAUSE of the problem is not as easy. Knowing what to do about the fluency problem is even tougher. Katie and I want to be very clear: Poor code knowledge is the cause of many reading fluency difficulties! If you know the cause of a problem, the problem is easier to remediate! Increasing a child's code knowledge often results in improved reading fluency and spelling accuracy. The free printable reading activities on this page can help you. Katie and I both believe many struggling readers are incorrectly identified with learning disabilities. Their reading struggles are related more to instructional issues than any learning problem. Some identified children simply need explicit and systematic teaching of the advanced written alphabetic code to make reading progress. A high percentage of the children referred to me for formal reading assessments demonstrate weaknesses only in their understanding of advanced code. As a result, they use memorization, guessing or other unreliable reading strategies as their primary method for decoding words. Unfortunately, outdated instructional practices cause more reading and spelling issues than anyone would like to admit. Children with good code knowledge have an EXCELLENT chance of becoming independent, fluent readers. Conversely, children with poor code knowledge run a high risk of developing poor reading behaviors and will struggle to gain reading fluency and comprehension as a result. Unfortunately, teaching children how to read the advanced written code is the most difficult aspect of teaching reading and is often the most neglected in both the university and elementary school classrooms. MASTERY OF THE ADVANCED WRITTEN CODE IS CRITICAL! Using reading activities designed to explicitly and systematically teach the advanced written code can benefit all children. For at risk or struggling readers, the use of reading activities that systematically teach the advanced code are essential! The free reading activities and printable materials on this page can help you learn about and effectively teach the advanced written code. 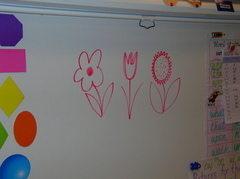 Children can easily understand that three different illustrations can stand for the same thing (as the flowers shown in the above picture). If children can understand this concept then they can understand that sounds can have different "pictures" (different letters) that stand for them as well. Print a list of code variation for each vowel sound in the English Language. Each list is organized top to bottom, most frequently occurring variation to least frequently occurring variation. Whenever we start learning about a new sound, the students generate a list of words that contain that sound. These posters are displayed and easily accessible throughout the school year as a reference. Once our sound poster is complete, we go through and read all of the words to make sure each word includes the specific sound. The above poster shows words that have the sound /ae/ as in cake. The different “sound pictures” for this sound are: a-e, a, ai, ay, ea, ey, & eigh. 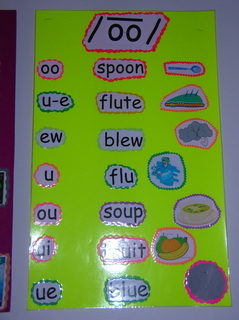 These sound pictures are highlighted (in pink) so children can practice locating the sound pictures and practice reading the words. 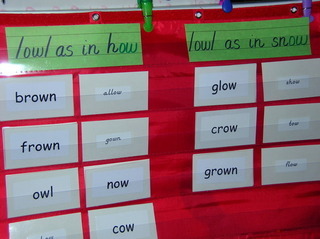 Children can practice highlighting the words independently for reading activities during centers. Help children spell words with code variation! Print template on card stock, laminate (thick laminate works best) and place magnets on the back. When students have trouble spelling a word, tell them the sound picture (the student takes that magnet) and writes the word on the board. Once we have generated a list of words for a specific sound and highlighted the sound picture for each word, we take a look and see which sound picture is most frequent. This sound picture is known as "The President". The second most frequent sound picture is known as "The Vice President" and the third is known as "The Treasurer". Simply glue the two templates together and laminate! We carefully designed Sight Word Flip It to teach Sight Words and the advanced Code the right way! Learn more in ReadingResource.net's iTunes store or the video below. Available for iphone and ipad devices. The vowel sounds in our language contain the majority of code variation and code overlap. Teach kids to properly decode words by explicitly and systematically showing them the advanced code through the use of our specially compiled Reading Fluency Flash Cards. These cards are not your ordinary sight word flash cards that are randomly thrown together for kids to memorize. Teach them to read, not memorize! Note: Sight Word Flip It is the App version of these flashcards (with bells and whistles). 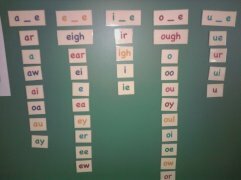 They organize common high frequency and sight words by sound. They offer effective ways to provide corrective feedback that works. They systematically teach all spelling patterns for each vowel sound. They allow kids to figure out the "tricky" parts of a word independently. They are great for center activities. 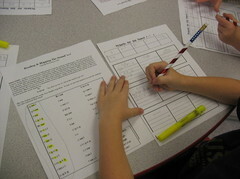 They provide a quick and easy way to practice decoding skills prior to small guided reading groups. They reinforce whole group phonics lessons. Parents and volunteers can easily learn to use them. They work! Trust us. We use them all the time. They compliment any existing reading program! We've done all the hard work for you. We've created the word lists. We've organized the sounds. We've made sure all spelling patterns are included. We've even color coded the cards for you! All you have to do is save our template and when ready print on full Avery Labels 8163 sheets. Simply use the new labels to make your cards. This is much easier than trying to make them on your own! For $9.99 you'll save yourself hours of prep time. Reading Fluency Flash cards are a great supplement to any reading program. Now Available! Visit the Download Central Page! Fluency Builders do just that...build oral reading fluency. 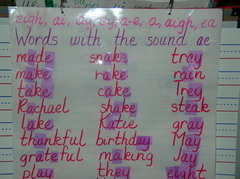 As children read through the text, the sentences 'build' upon themselves as one additional word is added to each line. This format naturally enhances fluency and because our passages are organized by vowel sound they provide great decoding practice as well. Struggling and new readers benefit from the built in fluency support that this fluency builders provide. Fluency Builders work with any reading program. Great for small group, centers, partner reading, and homework practice. Parents and volunteers find them easy to use too! More video demonstrating Reading Fluency Flash Cards and Fluency Builder Passages with a first grade student. These entertaining games systematically teach the spelling patterns (code variation) for each long vowel sound. Five separate games are included, one for each long vowel sound! Simply print and cut out the cards. Students take turns picking a card and reading the word. If a student reads the word correctly, they get to keep the card. When students pull out a "spoiler" card, they must put all of their cards back. The student with the most cards at the end is the winner. Fun and easy for kids to play. Katie and I use them daily for small groups, center activities and easy homework practice. Great for struggling or dyslexic readers. Now Available! Visit the Download Central Page! "Mapping” is a reading activity that helps children segment sounds in words by establishing a left to right symbol to sound response for reading AND writing. It is a reading activity to teach advanced code and code variation. For this activity, you will need a copy of the mapping template and a word list for the specific sound you are working on. Use the documents below for a detailed explanation on "Mapping Advanced Code". 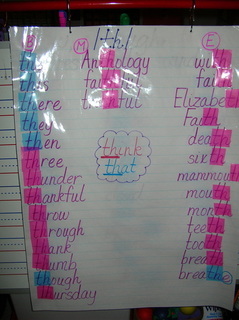 Word lists for all of the vowel sound combinations can be used for the "Mapping" activity above. These lists are also great to send home for additional reading practice! Here is a great reading activity using the Advanced Code Word Lists. We often use the term "Sound Pictures" often to refer to letters because technically, letters are "pictures" for sounds and the term "sound pictures" cues kids into the nature of what letters do, they stand for sounds. Also, as you've read we use the terms "Advanced Code" & "Code Variation" to describe when two or more letters represents a sound and when one sound in our language can be represented more than one way. The power of using controlled word lists that are organized by sound to improve reading decoding is undeniable. You can see in Video #1, Aaliyah truly struggles to read accurately. Her word attack strategies were poor, she often guessed and I certainly did not prompt her to read the words from left to right. I gave her no corrective feedback at all. Now watch what happens no more than 5 minutes later after I highlight the advanced code and all the code variation (spelling patterns) for the Long E sound. Big difference huh? By using simple reading activities like this with a controlled word list her accuracy goes up, her word attack skills improve and her confidence is higher! That is what we like to see. The advanced written code causes more reading problems than you can possibly imagine. By planning reading activities to teach it explicitly and systematically you can truly can see remarkable reading gains in a short amount of time. It also helps to have such a hard worker like Aaliyah. We heart her! 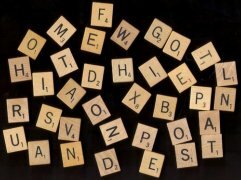 Students can locate the "pictures" by highlighting or by placing actual Scrabble game pieces over the "pictures" for various vowel sound combinations. Then, they must add those numbers together to get a total for each word. A great reading activity to integrate reading with math! 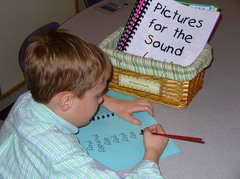 Sound Books follow the same format as the mapping activity above only each sound picture is written on its own page. Books can be laminated and bound so that students can practice reading the words independently. A useful reading activity for centers and independent reading time! Using the above templates, cut and glue each card on a poster. 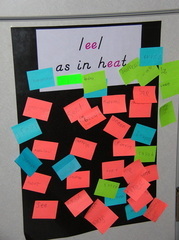 Have students in your classroom write words that contain that sound on small Post-Its. Add to the posters throughout the school year. A great way to make the code ever present in your room! Children must understand the basic code perfectly before they can begin to decode words containing advanced code. They need to be explicitly taught how to look for the “sound pictures” in words. For example, in the word “said,” the “ai” is making the sound /e/ as in bed. The “ai” is NOT making the sounds /a/ and /i/. Therefore, the “ai” makes the word “said” tricky. This template is great to do with children each week when they are practicing spelling words at home. This template can also be enlarged and laminated to use in the classroom! 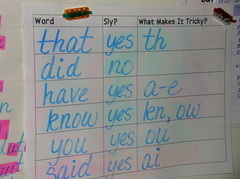 Although there is much hesitation amongst some educators as to whether or not having children work with nonsense words is appropriate; the goal of using nonsense words is to determine if kids have mastered the alphabetic principle (letter combinations represent sounds in words and these letter sound combinations can be blended together to make new words). Working with nonsense words is in place of common decodable words that children might already have learned/memorized, like “play,” “her,” and “read”. "Sight Words" were originally defined as words with such irregular spellings they had to be memorized. Later, memorizing all words by sight became the major mode of learning to read in whole language approaches. A huge stray from the original definition. There are 38 high frequency words that are NOT decodable and will have to be learned by sight. Every other high frequency word is decodable. 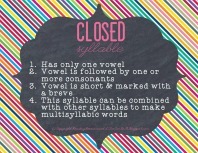 It is important for students to recognize syllables in words. When they are able to say one syllable at a time, reading (and spelling) becomes much easier. Luckily, recognizing syllables is an easy concept to teach. Use our posters as a reference for students in the classroom! Our NEW App For Teaching Advanced Code! Available Now In Your iTunes Store!